This entire collection was on a special exhibit at the Ronald Reagan Presidential Library, located in Simi Valley, California. It ended in Jan 2018 and continued to The National Geographic Museum in Washington DC, ending in Jan. 2019. I am pleased to bring you one of the world's best private Titanic collections, featuring possibly the greatest gathering of authentic RMS Titanic fabrics, as well as a large group of other rare and priceless artifacts. There is pine deck wood, beautifully carved large pieces made from authentic wreck wood, a complete deck chair from both the Titanic and Carpathia, and other rarities. It is 100% U.S. Disabled Veteran owned and operated. This site is also one of the very few, if not the only, place on earth that regularly sells real Titanic artifacts (not fakes or reproductions). Shop at our store were you can purchase a variety of actual relics from the Titanic affordably priced...certainly not out of reach to the average collector. I hope you enjoy the online museum and the history behind each piece. 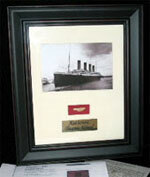 Please visit our friends at www.OnlineTitanicMuseum.com to view other priceless relics! Helping collectors - Find out how to identify fake paper collectibles, such as posters, postcards, cards and other high-end paper relics. Shown with detailed examples.